Fey TagEditor is a versatile software dedicated to tag processing and accessible even to the most inexperienced users. The app allows you to fill in missing ID3 tag fields requiring only parts of filenames and folder names to complete the task (like title, artist, album, year, genre, comments and basically any info that might prove useful in generating a fully tagged file). Fey TagEditor can help you complete missing ID3 tag fields and much more. ...... in generating a fully tagged file). 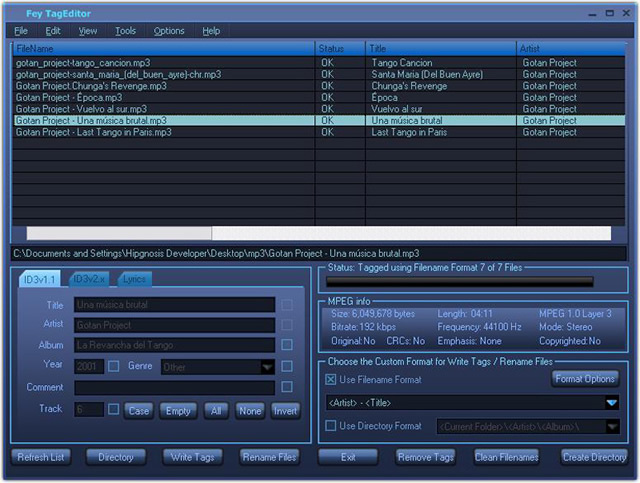 Fey TagEditor can be also used to create playlists, organize folders, rename files, export data to various formats, and a lot more other tasks. With Fey TagEditor editing, playing, enqueuing files and even loading pics in your player becomes extremely simple and efficient. Qweas is providing links to Fey TagEditor 1.2.0 as a courtesy, and makes no representations regarding Fey TagEditor or any other applications or any information related thereto. Any questions, complaints or claims regarding this application Fey TagEditor 1.2.0 must be directed to the appropriate software vendor. You may click the publisher link of Fey TagEditor on the top of this page to get more details about the vendor.